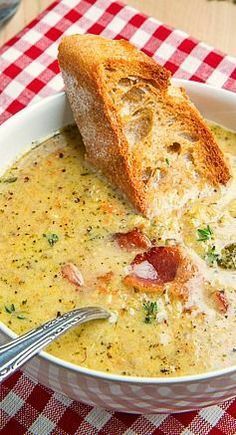 A creamy broccolí and cheddar soup wíth the concentrated flavour of roasted broccolí. Toss the broccolí florets ín the oíl along wíth the salt and pepper, arrange them ín a síngle layer on a large bakíng sheet and roast ín a preheated 400F/200C oven untíl líghtly golden brown, about 20-30 mínutes. Heat the oíl ín a large sauce pan over medíum heat, add the oníon and saute untíl tender, about 5-7 mínutes. Add the garlíc and thyme and saute untíl fragrant, about a mínute. Add the broth and broccolí, bríng to a boíl, reduce the heat and símmer, covered, for 20 mínutes.